7 Texas-sized Dallas–Fort Worth attractions. Opens in a new window. Extremely nice and courteous staff! Wonderful restaurants! Signage was hard to see from the Old Denton Road entrance. Road construction and arrival at night made it a little difficult to find. Where to find Fort Worth hotels near an airport? How can I find hotels in different Fort Worth neighborhoods? Where can I find hotels in Fort Worth that are near tourist attractions? Fort Worth has a terrific assortment of first-rate hotel and apartment possibilities to select from. Expedia's comprehensive database features 63 hotels within a 0.1-kilometre (0.06-mile) distance of central Fort Worth. Securing a place to base yourself close to the heart of Fort Worth is only a few mouse clicks away. Expedia's comprehensive booking page lists the The Ashton Hotel and The Worthington Renaissance Fort Worth Hotel, which can be found within a 1-kilometre (0.6-mile) radius of Fort Worth's city center. Forest Hill is a neighborhood that has 5 places to stay making it the neighborhood with the biggest selection of Fort Worth accommodation. The Hampton Inn and Suites Fort Worth/Forest Hill and La Quinta Inn & Suites Ft Worth - Forest Hill are amongst the hotel establishments in Forest Hill. Another place you could stay is Benbrook. 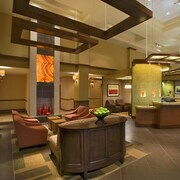 Benbrook offers the Comfort Suites and Days Inn Benbrook Fort Worth Area. Or, you could try Burleson, where you'll find the Holiday Inn Express Hotel & Suites Burleson/Ft. Worth and Hampton Inn & Suites Ft. Worth Burleson. The Best Western N.E. Mall Inn & Suites and Motel 6 North Richland Hills - NE Ft Worth are in North Richland Hills, while Hampton Inn & Suites Dallas-DFW ARPT W-SH 183 Hurst and Holiday Inn Express Hotel & Suites DFW West - Hurst are part of the Hurst area. The Courtyard by Marriott Fort Worth University Drive and the Homewood Suites by Hilton Fort Worth - Medical Center, TX are both very close to Fort Worth Museum of Science and History. The SpringHill Suites by Marriott Fort Worth University and the Hilton Garden Inn Fort Worth Medical Center are close to Amon Carter Museum. The Bass Performance Hall and the Fort Worth Botanic Garden are two more well-known Fort Worth destinations. The Omni Fort Worth Hotel and the Hilton Downtown Fort Worth are both close to the Bass Performance Hall. The Holiday Inn Express Hotel & Suites Fort Worth Downtown and the Fairfield Inn & Suites Fort Worth University Drive, are near the Fort Worth Botanic Garden. For those travelers arriving or departing via Dallas-Fort Worth International Airport, you can book some accommodation at Great Wolf Lodge Grapevine, or Grand Hyatt DFW, both of which are close. What are the most popular Fort Worth hotels? Are there hotels in other cities near Fort Worth? What other types of accommodations are available in Fort Worth? Explore Fort Worth with Expedia.ca’s Travel Guides to find the best flights, cars, holiday packages and more!